In the above HTTP call, the "instanceDir" parameter is not needed if the core is a direct child of the Solr home directory (the directory that contains the "solr.xml" file). It is also worth noting that the command will fail if the directory has a file named "collection.properties" with a "Core already exists" error. If you want to build a script to load cores automatically, you will need to both delete or rename the "collection.properties" file and issue the CREATE command. 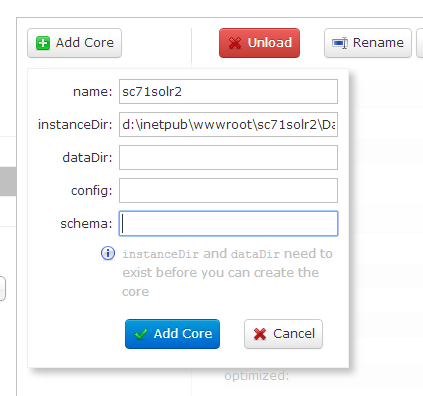 This is one good reason to locate your cores in the Solr directory: when Solr is started, these will load automatically provided they have a colllection.properties file, whereas externally located cores needed to be manually loaded. So what needs to be in the core directory? A file named collection.properties. This can be empty, in which case the core will be given the name of it's directory. It is not necessary to create a "data" folder to store the Lucene index; Solr will do this itself. To my mind, a logical Solr set up for a developer workstation would have Solr running on the standard 8983 port, running with Jetty from a start up script or a windows service (I have had good experience with this one), with separate collections for each Sitecore environment as children of the Solr home directory, or optionally stored in a "Sitecore Cores" directory. Since Solr will recusively search for folders with "collection.properties" at startup, these will be automatically loaded.